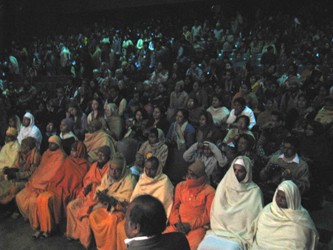 Swami Supurananda, Dr. Parijat De, Dr. Jyotirmoy Samajdar and the others of Narendra Jyoti. (Down) An invitation card for the long-awaited event. 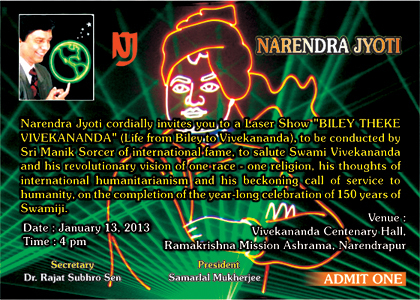 January 13, 2013: Another historic day - this time it is for the Narendrapur Ramakrishna Mission and Narendra Jyoti , KolKata. 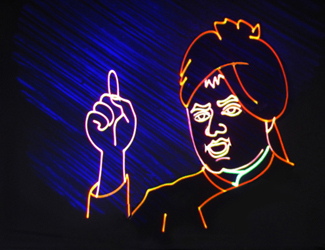 The laser documentary on “Swamiji” created a stir again. “Absolutely spell-bounding show”, said Swami Suparnanandaji, the Secretary of Ramakrishna Mission Ashram at Narendrapur. Earlier, prior to the show he felicitated Manick and Mary-Kom with gifts and flowers. 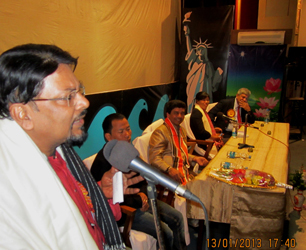 The show started at 6:30 pm, after an award ceremony program conducted by Narendra Jyoti. 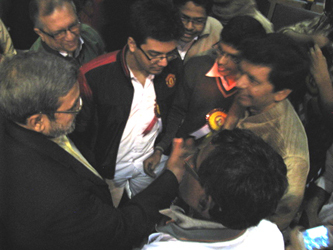 The event took place at Vivekananda Centenary Hall within the Ashram. An estimated 1750 people watched the show. 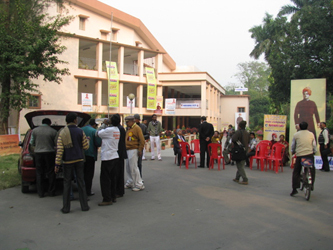 (Left) Entry to the show venue, Vivekananda Centenary Hall. (Right) A portion of the packed auditorium. An estimated 1750 people were at the audience. (Left) At the guest table on stage. 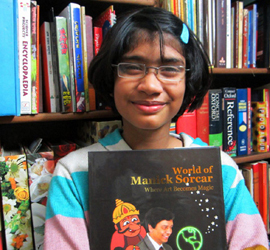 Manick Sorcar and Mary Kom were felicitated with flowers and gifts. (Right) "Arise, awake and stop not till the goal is reached", says Swami Vivekananda, in a scene from "Swamiji". Prajna Das: It was so touching programme..darun legeche..i think this laser show had to be shown by me.my life actually neede a show like this..because,inspite of having so many books on Swamiji,I did not read them at all.even I did not believe in GOD as well as..But now everything is quite clear to me.Thanks a lot sir for making such an unvaluable project and presenting it for us..Bless me sir that i can be a successful doctor in life...thanking you,Prajna. 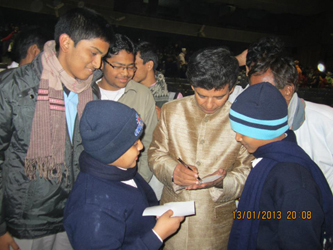 Arghya Ghosh: We feel blessed to watch your show Sir.. I am at Narendrapur since school days and now I am a college student there in Narendrapur, and I'm sure that the audience in the V. C. Hall, irrespective of age has never enjoyed a programme like this. Actually, all the facts shown about Swamiji was known to us, but the presentation was not only unique, also just mesmerizing.. Thanks to Narendra Jyoti, our senior Dada s for conducting this.. And thanks to you Sir for everything you did..
Nikhil Kumar: Dear sir, i am feeling very proud as you are spreading the message of swamiji in a very unique way. I am proud to be a part of this institution of swamiji. Riddhi Roy: The laser show was awesome.............Go ahead with more innovative laser shows like this.